"And that's the way it is," Walter Cronkite would cheerfully and authoritatively sign off. Not nearly as cheerful as, say, Paul Harvey's "and now you know" tag-line delivery, but, like Harvey, he seemed to give off an aura of respectability, incorruptible fidelity and inviolable integrity. When Cronkite told you that was the way it was, well you knew that was the case. 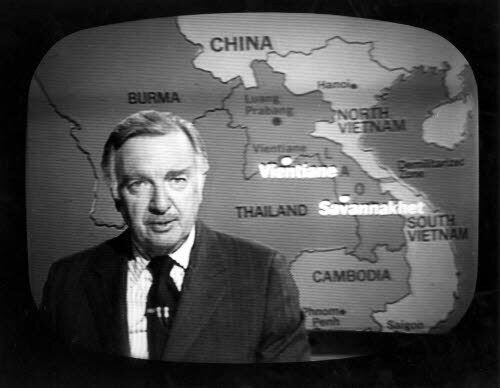 Cronkite represents for many, an era of journalistic propriety, inviolable fidelity and unbiased reliability that seems to hearken to a bygone era. With the increasing polarization, America has been experiencing for years the bifurcation of perception seems to grow unchecked. This climate breeds bias and the public seems to eat it up. In 2016, Fox News and MSNBC both easily beat out CNN. Not hard to do considering <a href="https://www.adweek.com/tvnewser/cable-network-ranker-week-of-june-19/333681">reruns of Fresh Prince Nick at Nite</a> and <a href="https://www.adweek.com/tvnewser/basic-cable-ranker-week-of-aug-6/373579">Ancient Aliens on History channel</a> have beaten out CNN. According to Adweek, as of May Rachel Maddow at MSNBC and Hannity at Fox News were roundly thrashing CNN. Not that CNN isn't biased, it's apparently just not biased enough to keep up with the taste for infotainment slanted towards a specific audience's bias. Where did this situation arise though? Well, <a href="https://www.nysun.com/national/how-walter-cronkite-betrayed-journalism/87905/">according to the New York Sun</a>, "the wellsprings of the public rage against the national media has been the fertile ground from which have grown Fox News, Rush Limbaugh, Ann Coulter, Hannity, Beck, and the entire Tea Party, scores of millions of people shaking their fists at the liberal journalistic-academic and Hollywood and Wall Street establishment, need look no farther than this book." Ironic in hindsight considering Cronkite's liberal bent. Ironic but not overly surprising considering that every action has an equal and opposite reaction. "In reading this first major biography of Cronkite, I came to realize that the man who once dominated television journalism was more complicated—and occasionally more unethical—than the legend that surrounds him. Had Cronkite engaged in some of the same questionable conduct today—he secretly bugged a committee room at the 1952 GOP convention—he would have been bashed by the blogs, pilloried by the pundits, and quite possibly ousted by his employer." Those were different times. There were only the "Big 3" networks which were still trusted and believed to be free from any sort of bias. Propaganda was what Soviets did, it couldn't happen in a free press within a Democratic society. But are the times really that different? As we covered recently, WikiLeaks is being sued by the DNC for "election meddling" despite the wealth of evidence that they colluded with certain reporters with whom, according to emails published by WikiLeaks, had "arrangements" with. Not too different from the RFK issue. Exclusives can be both bread and butter to a hungry journo. It wasn't until retirement that Cronkite "came out" as a liberal. This didn't surprise some, of course, considering his "special relationship" with politicians like RFK and his outright enmity against LBJ and Barry Goldwater. (If Kurtz was to be believed the feeling was mutual regarding Goldwater). “I thought that some day the roof was going to fall in … I don’t know why to this day I got away with it.” Kurtz, who was a neighbor to Cronkite for years, confided that his own ideological bent “affected how I looked at the world” but maintained that it did not affect his reporting. So, was Cronkite really telling us the way it is, or the way you see it which was, admittedly, "affected" by political preconceptions? An example of "how he saw it" occurred in 2004 on Larry King Live Cronkite suggested, regarding recent video sightings of Osama on al-Jazeera, that GWB's chief political strategist, Karl Rove "probably set up bin Laden." On that point, I may almost defer to Walt especially considering the enormous variance in "bin Ladens" in various videos including those obtained by Rita Katz's SITE (Search for International Terrorist Entities) intelligence group he could be on to something here. SITE was a private company (and a non-profit at that) that received ample aid from <a href="
Last November, Columbia Journalism Review published an opinion regarding the "crisis of trust in journalism." In fact, CJR reported that the issue extends to the reporters themselves, in part due to strategies like "ideological rifts," "branded content" and other gimmicks intended to improve flagging interest and faith in media reportage. The unfortunate result being "decisions that have ended up deeply harming—or ending—journalists’ livelihoods or sense of humanity in their work." Financial Times has asked the important question of <a href="
https://www.ft.com/content/955f7d84-c60e-11e7-a1d2-6786f39ef675">whether the media can ever regain that lost trust</a>. FT pointed out how Gallup polls suggested that US faith in journalism peaked in 1976 around the time All The President's Men was released in theaters. <a href="https://news.gallup.com/poll/219824/democrats-confidence-mass-media-rises-sharply-2016.aspx">According to Gallup polls</a>, Americans’ trust in mass media peaked at 72 per cent in 1976, the year All The President’s Men hit cinemas. 2016, overall trust in the media was at 32% (only 14% for Republicans specifically). Between 2016 and 2017 the overall number rose modestly to 41% due to Democrat trust and confidence rising from 51% to 72% while Republican numbers are stuck at 14. One might wonder if feeding Trump haters stories about how Trump is responsible for hurricanes and his nasty habit of having two scoops of ice cream might have a bit to do with the rise in liberal faith in media and stagnation of conservatives. When you consider that the last time Republican numbers polled above 50% was during the Monica Lewinsky coverage it begs the question do people just trust what they want to hear? It's not just Republicans though, a Politico/Morning Consult poll in October showed 46% of Americans believe news media fabricated Trump stories. In a few cases, this has been shown to be demonstrably correct. Remember the Sean Spicer in the Bush story that was <a href="https://www.inquisitr.com/4212045/melissamccarthy-seanspicer-snl/">retracted only after the SNL skit had already been written. Or how about the bit about Trump removing an MLK bust from the White House that was <a href="https://thehill.com/homenews/media/315486-trump-attacks-time-report-for-mistake-about-mlk-bust">also later debunked</a>. And that's another issue with covering the news. Medicine is an industry, as the old joke goes, keep a patient sick you have a customer for life. Recidivism, technically, increases the GDP and is job security for those in law enforcement and the judicial system. In the case of media coverage that means Fox knows their bread is buttered on the side of conservative editorializing and Washington Post is aware calling Trump "complicit" in Hurricane Florence is just good for business. Good for business in the short term, but is it good for anything else? I cut my teeth on Noam Chomsky and works like Manufacturing Consent a couple decades ago. I'm showing my age here, but I remember a time when <i>actual</i> leftists and progressives (no, I'm not talking about Democrats for the most part) had a healthy distrust of the mostly corporate run media. That skepticism is healthy to an extent but lack of faith in government and the press the sort we are dealing with now also happen to be preconditions for civil war. On the bright side, like cancer and repeat offenders, certainly would grow certain sectors of the economy to an extent. FT references a Columbia University report that points to how dry, "inaccessible" journalism doesn't get near the traffic as hyper-partisan pieces. A Pew Research Center poll cited reports that 63% of those polled believe the national news media has a negative effet on the way things are going in the world. Bear in mind that puts them nearly 20 points below banks and financial institutions (remember the folks responsible for the 2008 financial bust). We've evolved as a people in the 40+ years since All The President's Men was released. Advertising and propaganda operate in a manner similar to viruses, they must evolve to survive as our immunity to their attacks evolve. We are far more skeptical of the media, the government and other public institutions than we were in Cronkite's heyday and, as a result, will likely never return to those halcyon days for reporters when all you needed was a tight Windsor knot, an honest looking face and a good broadcasting voice would get you through to the millions of media consumers who, after all, only had three choices, to begin with for their nightly news. That said, it could be possible to stem the tide somewhat. <a href="http://pressthink.org/2017/12/show-work-new-terms-trust-journalism/">Pressthink has some ideas</a>. Transparency and a "show your work" philosophy is a part of their plan. That means less of the trend of sourcing from "a person close to the situation." A greater emphasis on ethics in journalism is also important. <a href="https://ethicaljournalismnetwork.org/trust-in-journalism-the-ethical-challenge-of-the-information-age">Ethical Journalism Network points out</a> one "challenge of the information age" is related to fact-checking, eliminating plagiarism and resisting the errors that can occur with the "rush to publish." Case in point, CNN has reported that comedian and living meme Sam Hyde was the perpetrator of at least two mass shootings. They aren't alone here either. Multiple major media sources around the world have reported Sam Hyde as a terrorist several times in the last few years. YouTuber <a href="https://i.4pcdn.org/pol/1535410758657.jpg">Mr. 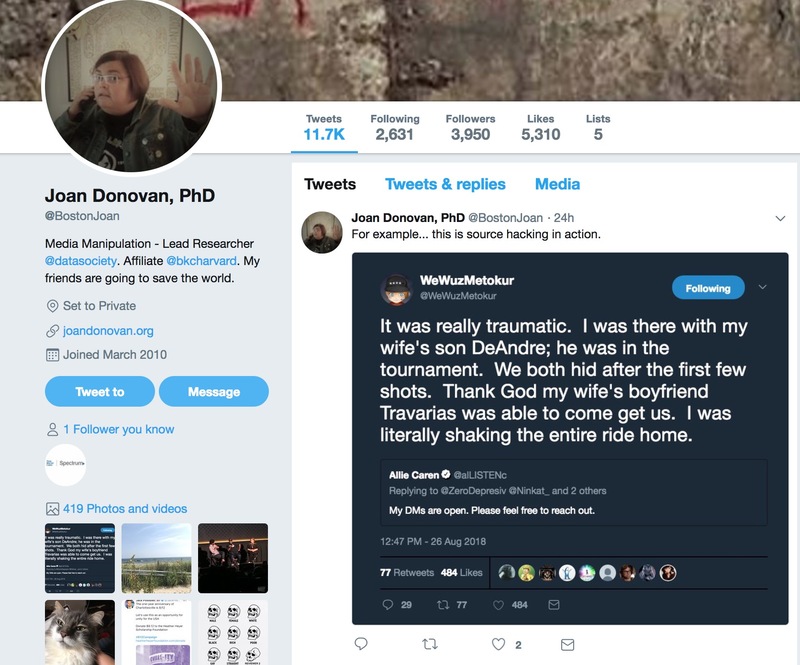 Metokur was accused by Joan Donovan Ph.D. </a> of the Data and Society think tank of "source hacking" (pretending to be at the scene of the eSports shooting in Florida). Donovan blames "fringe groups" for feeding false information to "authoritative sources." Well, if they're so authoritative then why didn't they verify their information before rushing to print? That said, even if money motive disappears and overnight quality journalism is rewarded and ethics embraced the likelihood of us ever reaching the level of faith that was enjoyed by Cronkite and others from his era is seriously unlikely. i remember long ago in the land of the 80's i was watching the evening snooze. 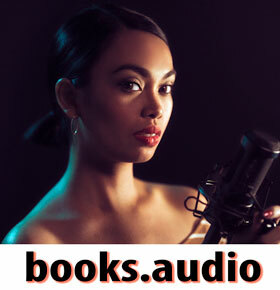 i was not at all interested in what one station was reporting so i switched stations. SAME STORY! so i went to the last news station SAME GODDAMNED STORY. all three major networks aired the exact same stories at the same time. that's when i knew that our media had been corrupted. BUT THEN, BushCo did 9/11 and those rotten bastards who call themselves "journalists" who KNOW that 9/11 was a false-flag, gave cover to the monsters in the CIA, FBI, Mossad and White House and are STILL COVERING FOR THEM TO THIS DAY. our democracy has been overthrown in a bloodless, silent coup.